Illinois, a Midwestern state known as the Prairie State for its long, endless seas of prairie, is boarded on the west by the lazy Mississippi River and to the north by Lake Michigan. Probably best known for the sleek, sky-scraper filled skyline of Chicago, this fertile land is also filled with spectacular nature and high-quality drink and dining experiences. Grab your phone and get ready to explore forests, rolling hills and wetlands. You’ll have plenty of opportunities to reward yourself with a quality cocktail or delicious meal afterwards. For some insider knowledge about Illinois, check out our list of the best hidden gems to hit up during your visit! The Cahokia Mounds State Historic Site is located in southern Illinois between East St. Louis and Collinsville. This pre-Columbian Native American site spans over 2,200 acres and preserves what remains of a much larger ancient city that used to cover 6 square miles. Originally inhabited by the Mississippian culture, it was founded over 1000 years before the Europeans arrived and is considered to be the largest and most complex archaeological site north of the pre-Columbian Mexican cities. Visit the Cahokia Mounds to see one of the 23 UNESCO sites in the U.S. It features about 80 man-made mounds that had different functions in the ancient society. Visit Monks Mound, the largest structure of four terraces that stands 10 stories tall. It was most likely a temple in ancient times, and was also inhabited by Trappist monks following the Euro-American settlement in the area. You can also see remnants of old copper workshops and the plaza that was the center of the community. It’s a priceless look into an ancient civilization that spawned advanced societies in the central United States, and is one of the best historical gems in Illinois. The Mississippi Palisades State Park is a National Natural Landmark located just north of Savanna in Carroll County. 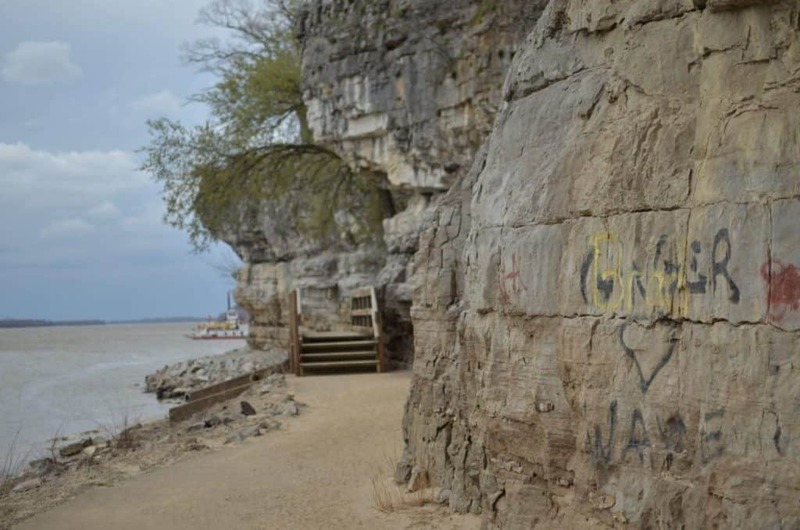 The park preserves many caves and tall cliffs overlooking the Mississippi River and is a beautiful natural retreat. Bring comfy walking shoes and a camera to capture the views! Hike the trails at the Palisades. As you do so, you will be retracing the steps of the Native Americans who also took to traversing the terrain by following the bluffs. Bring your camera to capture the sight of the steep cliffs and beautiful river views. There are limestone caves that are sinkholes descending straight down into the earth with gorgeous rock formations formed from the erosion, such as Indian Head and Twin Sisters. Enjoy the diverse wildlife and the rugged 15 miles of trails. You can even camp along the palisades if you’d like to stay a few days. Cache River State Natural Area is located in southernmost Illinois on an ancient floodplain carved from the earth by the Ohio River. Long since separated from the Ohio River, the Cache River continues to lazily trace its curves across the beautiful wetlands. Come visit this lush natural preserve filled with diverse recreational activities and natural wonders. While here, admire the massive cypress trees whose trunks exceed 40 feet in circumference and that date back more than 1,000 years. The wetlands is home many migratory waterfowl and diverse wildlife, with over 100 endangered species. There are many hiking and biking opportunities, or canoeing and fishing for the water sports lovers. Check their website for seasonal hunting opportunities as well. Enjoy a respite from the city at Cache River State Natural Area. 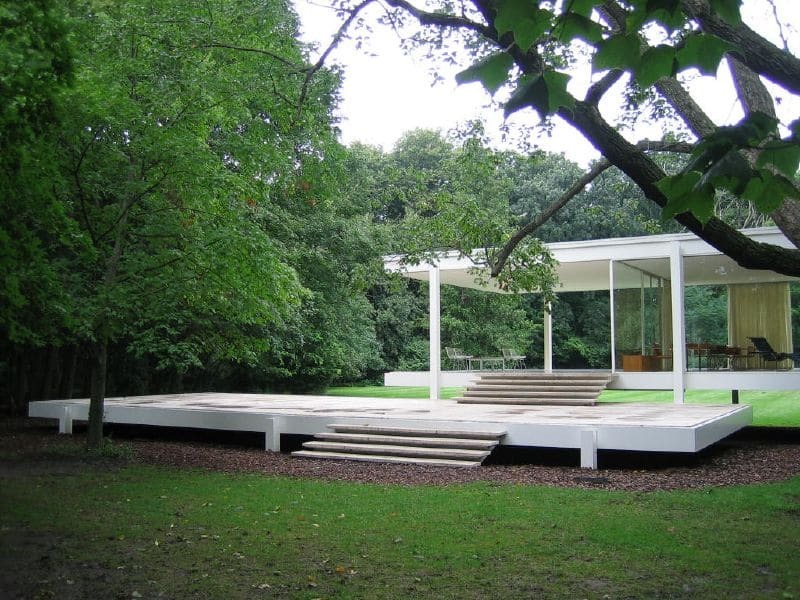 The Farnsworth House is located in Plano and was designed by Mies van der Rohn in 1945. Finished in 1951, the house is an important representation of the International Style of architecture juxtaposed with sleek Modern structure, making it a vital example of American iconography. Farnsworth was originally intended as a private retreat for the owner until its purchase and opening as a public museum in 2003. Come visit yourself to understand its significance. The house is visually stunning, comprised of mostly glass that blends modernity with the surrounded lush greenery. Mies van der Rohn outdid himself in this artistic design that is now available for all to see and appreciate. Cave-in-Rock is a village located in Hardin County. Named after its most prominent feature, the Cave-in-Rock, this little town has seen quite the colorful history –the cave, yes, located in a rock, was previously used as a stronghold for outlaws like river pirates and highwaymen, as well as post-Civil War bandits. The town itself was originally inhabited by these fugitives running from society! Take a trip back to a wilder time and visit the actual cave. It is 55 feet wide and was first discovered by M. de Lery, a Frenchman who described it as a cavern in the rock, much like the English name it bears today. Enjoy the quaint town and retrace the steps of exciting past criminals like the Sturdivant Gang. Explore the cave and enjoy the a curious piece of Illinois state history. Located in Pomona, the Pomona Natural Bridge is a hidden hiking treasure waiting to be discovered in Illinois. The trail itself is a fairly easy hike that is perfect for all ages. It forks to the left for a more kid-friendly trail, but both will lead you to the natural bridge. The natural bridge is 90 feet long and about 8 feet at its widest. It’s made entirely of sandstone and is entirely natural, carved by the water passing over it. If you continue your exploration, you’ll find that there is a small cave a few yards downstream and is a very scenic location for photographs. The trail is conveniently close to the Southern Illinois Wine Trail as well, so both adult and kid visitors will be happy! Located in the heart of America, the Great River Road follows the Mississippi River as it travels down the western border of Illinois. Follow the 550 mile route to see some impressive views and breathtaking landscapes. You’ll be retracing steps originally left by Native Americans who used the fertile soil and waterways, places that are still beautifully preserved to this day. Take a weekend trip or longer journey to follow this western Illinois road. There are plenty of charming towns to break your trip, like Quincy, Fulton or Alton. Stop the car to walk along the banks and bluffs of the Mississippi and allow nature to soothe your soul. Take your bike along the Madison County Transit Trail or Ben Butterworth Parkway, or a river cruise from East Dubuque! There is no end to activities like camping, climbing or camping, so put this on your next travel itinerary. Grandview Drive is a two and a half mile scenic road that passes through Peoria Heights on Illinois Route 29. It’s a true hidden gem, with adjacent parks in Peoria and offering river views of the Illinois River. Make a day trip out of it to appreciate the historic homes in the area or to have a leisurely picnic on the benches lining the road. The land surrounded the drive is listed on the National Register of Historic Places, and it was even called one of the “World’s Most Beautiful Drives” by Theodore Roosevelt! Enjoy the lush park land in the valley or the relatively undeveloped areas only touched by park benches. It’s a great place to go think and get away for a bit, or to appreciate the local historic architecture. The Puppet Bike is a local street performing group in Chicago. A true curiosity, the bike is complete with a fully mobile stage that operates in the Andersonville neighborhood and the downtown Chicago Loop. It was created by the artist/inventor Jason Trusty, who constructed it himself with the help of his brother. Be sure to catch a show when you’re passing through Chicago! Trusty and 8 other performers ride the bike Chicago, stopping at intervals to climb inside the box and perform puppet routines. They’re even known to interact with the audience and work for tips only. Take the chance to get a high five from the performing puppets and leave a tip so that these creative artists can continue working their craft. The Kaskaskia Dragon is located in Vandalia, Illinois and is one of the remaining exciting roadside attractions in the state. Reminiscent of beloved fairy tales involving damsels in distress and pretty princesses, the design is sleek and simple, designed and cared for by Walt Barenganfer. The dragon has undergone some modifications over the years, such as the ability to spew fire! If you buy a dragon coin and insert it in the coin-box, the Kaskaskia Dragon will shoot flames for around 10 minutes or so. Be sure to stop in on your next road trip and pay a visit to this 35 foot tall metal dragon. 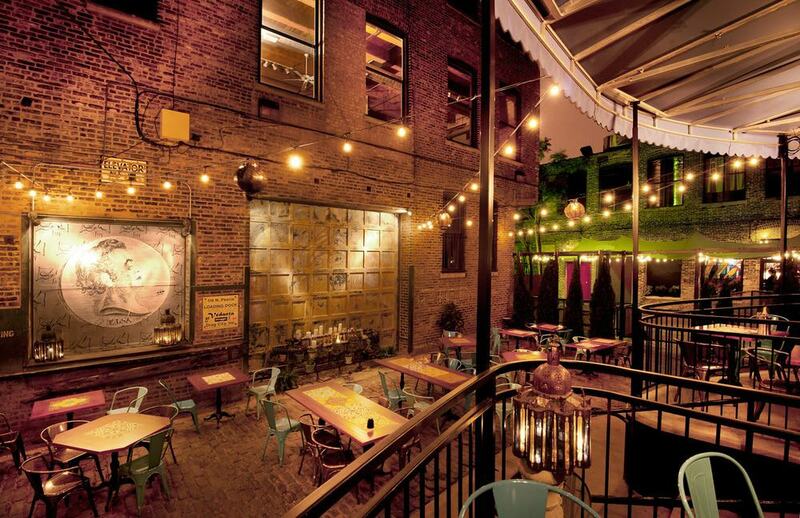 The Violet Hour is a lounge bar in Wicker Park that offers a luxurious retreat from the chaotic outside world. It brings to mind those roaring twenty speakeasy bars with custom cocktails and unique bartenders. Stop in at any time to enjoy their seasonal cocktail and food menus and be prepared to stay all night. Barkeeps are sure to entertain you here with their graceful ability to mix, shake and pour the cocktail menu designed by the “head intoxicologist”. The cocktails are top quality, featuring house-made bitters and different types and sizes of ice depending on the drink. Discuss your preferences with a bartender and relax over a few drinks and some delicious bites from the house kitchen. While the name might suggest a Rock n Roll environment, this curious place is actually a geologist’s paradise. Dave’s Down to Earth Rock Shop is a basement museum that is full of treasures like a bear skeleton, dinosaur footprints, and even dinosaur eggs! 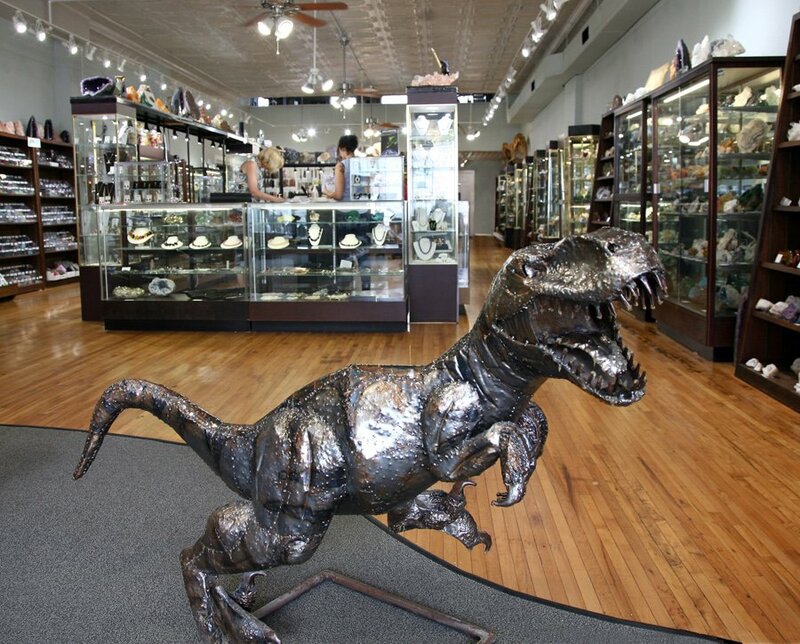 A place for the eclectic soul or those interested in paleontology and geology, pay this store a visit when you’re in Evanston. There are also several insects in amber that are true curiosities. Dave has collected a lot of these pieces himself from all over the world: China, Australia, and Europe. After you’re finished with the Art Institute or the Field Museum, head out here for a more intimate acquaintance with fossils and dinosaurs and relive those childhood science classes with these fascinating fossils! Have you ever dreamed about being a sleek super spy, or maybe a dashing James Bond? Then this store is perfect for you! 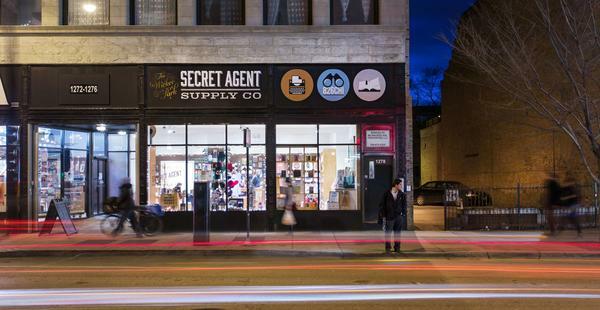 Located in Chicago, this is a veritable mecca for all those in need of super important gadgets like secret disguises, carrier pigeons, or whatever you need to attempt your next covert op! This store boasts a collection of supplies that even the CIA would be proud of. And, spyglasses and voice modulators have never had a more noble purpose. Whenever you shop here, you’ll be supporting a good cause while you do it – all proceeds go to the 826 non-profit organizations that runs a children’s writing workshop and tutoring center. Even adults have secret fantasies, so why not bring them to life here and help children while you’re at it? What more could you ask for! The Sears Tower looms over the entire Chicago skyline, which is in and of itself quite impressive. It’s the third tallest building in the world and stands 1,450 tall – making it the tallest building in the Western Hemisphere. The tower also offers the best views in the state, there are 4 10 by 10 feet compartments that reach out 4.3 feet over the edge of the 103rd floor Skydeck. Not for those with a fear of heights, come out here to feel like you are floating over the city of Chicago – even the floor is made of glass! You can see up to 50 miles around, which includes up to four states! It’s a perfect place to snap a shot or enjoy the adrenaline rush that comes with feeling suspended over a thousand feet in the air. The International Museum of Surgical Science is located in the Gold Coast neighborhood of Chicago, and is operated by the International College of Surgeons. Founded by Dr. Max Thorax in 1954, the museum features exhibits in Eastern and Western medicines, displayed by theme or surgical discipline. It is an ideal outing for any doctors or those fascinated by the medical profession. The museum is visually charming and housed in a 1917 mansion that is a replicate of the original version in Versailles. It was the personal residence of socialite Eleanor Whiting until the International College of Surgeons acquired it in 1950. Enjoy the architectural details before heading inside to peruse the historical medical artifacts. There are displays of paintings, drawings, medical equipment, skeletons and medical specimens. There is even also a contemporary art exhibit to round out its appeal! Oz Park is a public park located in the North Side of Chicago. It borders Lincoln Park High School and contains several statues fashioned after characters from The Wizard of Oz, which was written by a native Chicago reporter, Frank Baum. It was constructed in the 1950s following an effort to revitalize the area and because fans of the book used to gather in the old park to remember the past neighborhood resident, Frank Baum himself. Now the park features a walking/biking trail a little over a half mile long, and also contains gardens and a playground for children. It features 4 statues fashioned after the beloved book characters, The Tin Man, The Cowardly Lion, The Scarecrow and Dorothy & Toto. Stop by if you are also a fan of the Wizard of Oz. There are free outdoor movies offered in summer, as well as a fall festival and Art Therapy Connection Chalk Festival. Bring your child, or enjoy reliving childhood memories yourself! With a name as charming as the actual bakery, Hazel Dell, named after the town in which it stands, serves up delicious food popular and loved by the locals. Known for its scrumptious lunches that taste like they’re homemade, be sure to sneak in a spot early if you want to get a spot and a piece of pie – never mind the diets! Perhaps their star dish, the pies that they make each day are legendary. They’re 11 inches in diameter, and might possibly be some of the largest available. The flavors rotate daily, but usually include coconut as an option. Stop in for a local experience and enjoy a mouthwatering and shockingly affordable lunch, and finish it off with a delicious slice of pie! It’s a true culinary gem of Illinois. While New York City might be known as a culinary mecca for foodies, it is Illinois that is hiding a gem of a hole-in-the-wall restaurant. 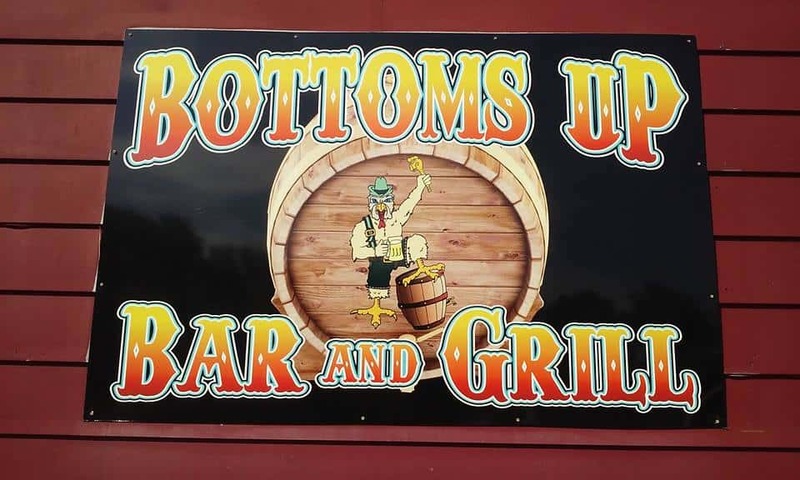 Bottoms Up has been open for business since 1896 and boasts a rich history of serving the German immigrants who populated the town of Neunert in the mid-1800s. It even brewed and served beer during the Prohibition era! Not much has changed in this classic establishment, vintage decor lines the inside along with old sports trophies and refurbished woodwork. Have a drink with the locals and dig in to some comfort food just the way we all wished we had time to make it. The chicken steals the show with its crispy succulent perfection, and you’ll be tempted to order a second round. The Uptown Underground is Chicago’s gem of a speakeasy. It’s a venue created with pure decadence and amusement in mind, with a stage for burlesque, vaudeville and variety shows. Located in a beautiful and spacious 7,000 foot basement of the Uptown Broadway Building, the venue is also historic, using the same floors as brick walls from when the building was first built! Rumor has it Al Capone hid a speakeasy somewhere in the building back in the day! Visit both of their lounges, the Moonshine Main Stage and the more intimate Starlight Lounge to give you extra time to sip on their speak-easy style cocktails. You can also play historic arcade games from the 20s and 30s! 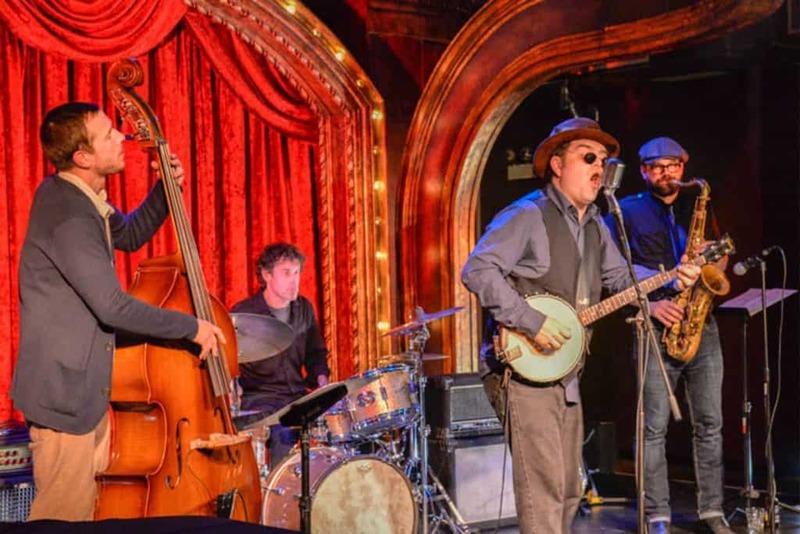 Stop in for a vintage-inspired night for a whiskey cocktail and cabaret show! Champagne is a symbol of opulence, decadence, and the good life. Usually saved by those of modest means for special occasions only like weddings or celebrations, most of us content ourselves with other more mundane drinks of choice. What if, for a night, you could live that dream of fountains of champagne as far as the eye can see? The RM Champagne Salon in Chicago offers a temporary solution. Tucked in a West Loop alley, this parlor positively oozes old world elegance and candlelit allure. Boasting a wide array of champagne options, from Cristal to Vilmart & Cie, enjoy the champagne straight and keep it flowing all night. Ever dream of a bar just for you, with no long lines or the obvious newcomer disrupting the regulars’ environment? Room 13 is the real-life manifestation of these adult dreams. In true speak-easy form, it’s located behind a mysterious unmarked door in a dark alley next to the Old Chicago Inn. Don’t try to just stop in – it’s protected with a constantly changing password given to members only. Stay at the hotel for an in to the bar, or sign up for a yearly membership. It’s worth the investment to sip on a cool cocktail reminiscent of the roaring 20s. The secrecy just enhances the experience. Alfred Caldwell Lily Pool is a Chicago Landmark located in Lincoln Park, and is also listed as a National Historical Landmark. It is an example of Prairie School landscape architecture. Originally opened in 1889 to cultivate tropical water lilies, the pools eventually fell into disrepair when that proved challenging. Alfred Caldwell redesigned the area to bring a poetic symbolism and new life to the area. Stop by today to appreciate his vision; he even invested his life insurance policy to finish the project when it underwent budget cuts. Still preserved to this day for the public, you’ll be sure to appreciate the serenity of the Lincoln Park pools. Spend some time reading in the Sun Opening or following the curving walkways. Enjoy the birds that sing the park’s soundtrack and visit the beautiful Lily Pool; the break from the city will do you good. 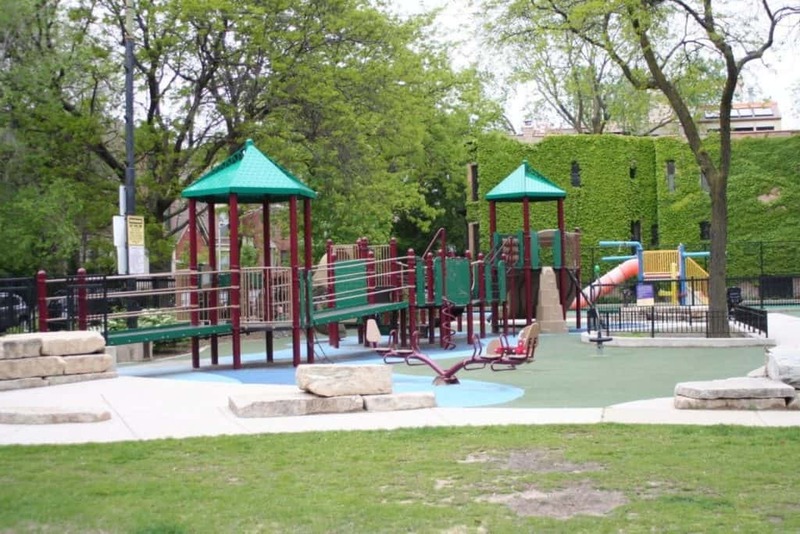 Located off Seminary Avenue in Chicago, Adams Playground is a community treasure and beloved by the neighborhood. It was named after a former Congressman, George Adams, who donated the land to the city in the early 1900s. The city then turned it into a great community space for children, complete with playgrounds, a sand court, and an ice rink in winter for ice skating! An ideal place to spend a quiet afternoon with the family, Adams Park provides ample opportunities for family fun. Cool off at the waterpark in the summer or sign up for activities offered in the field house. It’s a perfect place for a picnic as well!